What could be better than having popcorn and Chex Mix for a movie-time snack? 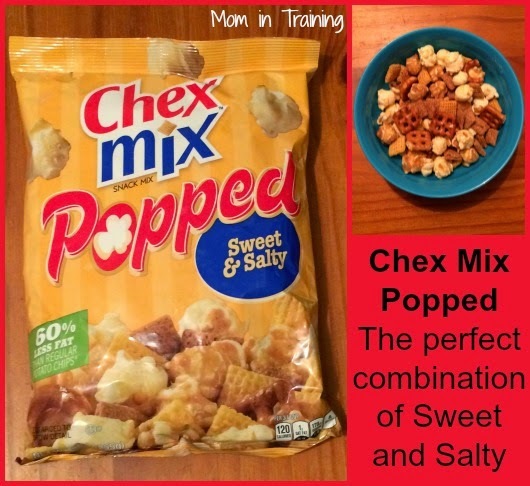 Having the new Chex Mix Popped Sweet & Salty snack mix! It's a combination of salty and buttery popcorn mixed with a glaze over it all to make it ooey and gooey. And to top it off it contains 50% less fat than regular potato chips, now tell me what's better than that? Well, having a bigger bag is one thing I can think of. My kids and I went through this bag in one sitting it was so good. Sometimes I like to have a little bit of sweet, but try to stay away from candy and chocolate in the evenings when watching television. This was perfect because it satisfied my craving for sweet, and it didn't leave me filling empty after like some snacks do. Next time I head out for snacks I'm going to look for the white cheddar mix and see if it's just as good. This sounds like a fun mix of goodies for the kids. My kids love popcorn and chef mix so it be be the perfect snack.